Manage your entire operation from your desktop PC or command center. 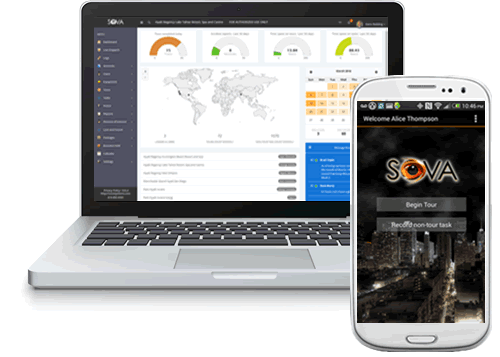 When users perform any activity in SOVA, from clocking in, to beginning a guard tour, recording a task like a key assist, lost and found entry, etc., these activities are timestamped by user, synchronized with the server, logged and presented in real time in the live activity feed. Our sophisticated mapping engine shows current guard locations and key activities taking place throughout the day. You can even look at a heat map to show what parts of your property are busiest. If SOVA determines that a security officer is inactive while away from the security base, alerts can be configured and sent via phone call, email or text message (SMS) to verify that the officer is not under duress. Our dispatch module takes the guesswork out of deciding how best to dispatch incoming calls or requests for service. With SOVA, a dispatcher will automatically know how many unfinished tasks all active users have in the field, what zone the user is currently located in, and how many dispatched calls he has already been given. Armed with this information, a dispatch officer can more intelligently make decisions on how to dispatch calls. With SOVA, you can also dispatch a call to a zone, and all users in that zone would receive the dispatch. Once one user accepts it, the task shows on the dispatch screen as accepted.